There once was a mighty nation – born of both noble and ignoble men and women seeking to establish a haven from tyranny and oppression. It was a tapestry woven on profound sacrifice for those most precious of gifts: life, liberty, and the pursuit of happiness. But it has suffered the loss of these rewards at the hands of the most insipid scoundrels of this or any era: The majority rule of this Supreme Court of the United States. By them, the rule of law has “officially” been rendered null and void. The most cherished example of self-rule and determination has been slain without cause. Indeed, murdered with no remorse by a squad of black-robed lawyers, drunk on the wine of a pernicious, secular immorality. They have insulted their authority under the Constitution by maligning this mighty document to assuage some perverse concept they find enlightened, but which, indeed, is nothing more than ancient lawlessness dressed in the fabric of a deluded, and selfish autonomy. 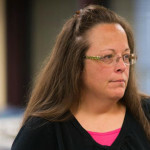 And so it is the most amazing thing to consider that a plain-spoken, unassuming, civil servant in northwestern Kentucky has decided to invoke the Doctrine of the Lesser Magistrate in defying these powerful justices in refusing to comply with their illegal ruling and, by extension, the confiscation of the rule of law. I got to thinking earlier as I write this, what I would do if I were in her shoes. Even more tantalizing, what would I advise her to do if I were her legal counsel; or her pastor? Very recently, in a wonderful discussion with a good friend of mine, we talked about that and I found myself searching for an answer. Here are my thoughts on the matter. First, as her advisor, I might recommend preparing for a long struggle in retaining her position as the elected Clerk of Rowan County, Kentucky. As things stand at this moment in time, she will not be allowed to do so easily if at all. The enemies of decency are very committed. Therefore, I would begin the process of raising donations, issuing statements and endorsing others who will follow in her footsteps as time goes on. It is entirely possible though she may find herself doing that from a jail cell, if she continues to defy the court order. I can’t help but admire the courage of her conviction. Second, she should never waiver in her commitment to fidelity to her Lord Jesus. For God has made it clear that He will NOT condone sin and He will not suffer those who do. I suspect that is advice I need not worry about giving her. But I have to ask this question of myself and to you who read this: Is that too easy an answer? Does that sound easy to do? Because, consider the Christians who lived before us and who wrestled with such questions down through the ages. History reveals their sacrifice and martyrdom. They defended what they believed in with everything they had. But we must remember the words of Jesus: “So give back to Caesar what is Caesar’s, and to God what is God’s.” (from Matthew 22:20-22) It applies here in large part as the chief rational for the Doctrine of the Lesser Magistrate, which is an important tenet of reformed, protestant theology from the early 16th century and articulated by John Calvin who is credited with first advancing the idea. The concept is also found in the writings of John Locke who greatly influenced the very framers of the Constitution. Ms. Davis is doing what Americans have traditionally done in the face of tyranny. It is no mere parlor debate about partisan politics. It is tyranny by judicial fiat, plain and simple. No one should make any mistake about that. No Christian should be comfortable with such a thing – as we eventually became with the Roe V. Wade decision. Effective: July 15, 1998. History: Created 1998 Ky. Acts ch. 258, sec. 4, effective July 15, 1998. This law is still on the books. (The above is found here online) This is the law Kim Davis is determined to uphold and took her oath of office to obey. All of this is far more than an opinion. It is no mere parlor debate about partisan politics. We are talking about tyranny by judicial fiat, plain and simple. No one should make any mistake about that. No Christian should be comfortable with such a thing – as we eventually became with the Roe V. Wade decision. We are by our lassitude giving free reign to tyrants. This is the very thing that signals the end of a free and democratic constitutional republic. But it is also an abdication of our obligation to love and obey the Lord our God if we say or do nothing. My question then has to be: “Can we as Christians remain silent?” Doing little or nothing (except complaining) may actually be facilitating our own ultimate persecution. Because by doing little or nothing, we become complicit. It is that simple. 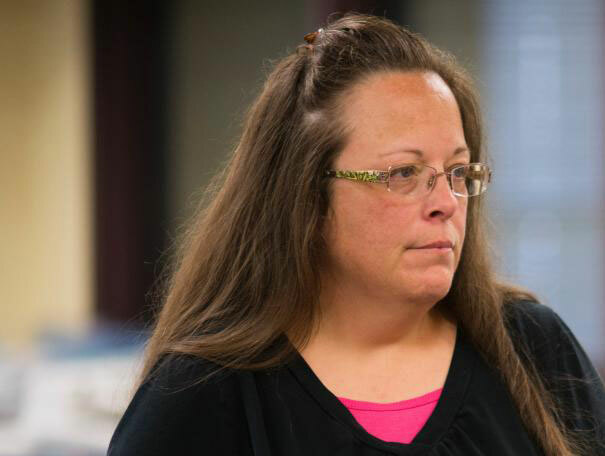 I don’t personally know Kim Davis, but I am beginning to think she is teaching us all a lesson in citizenship – both in this kingdom and the Kingdom of Heaven. The lesser magistrate is prominent in the Lutheran Magdeburg Confession of 1550, which argued that the “subordinate powers” in a state, faced with the situation where the “supreme power” is working to destroy true religion, may go further than non-cooperation with the supreme power and assist the faithful to resist. Shenandoah Christian Alliance does not endorse nor necessarily agree with all of the views held by Michael Peroutka. We present his video-taped address before the audience outside the facility where Ms. Davis was being held as they reflect the positions of SCA.